Bach’s music expresses joy, sorrow, excitement, and a profound beauty. But it is also very complex music, with many voices doing many things at the same time. Hearing and understanding everything that is going on is not straightforward, and it is not something that can be achieved just by listening, even after many repeat listenings. To fully comprehend how this music is crafted, it is necessary to read it. Reading and listening to this Bach masterpiece just got easier with a new video that combines two open source scores with the piano playing of Kimiko Ishizaka to present you a complete performance of the Well-Tempered Clavier. The Fugues, in particular, are quite special in this video. For each Fugue, the score separates the voices into their own lines, so you can see how all of them fit together. Take this example from the 5-voice Bb Minor Fugue to see how clearly the voices are shown. Two sources for scores were used. For the Preludes, the Open Well-Tempered Clavier score from Musescore was used. For the Fugues, the public domain engraving by Kyle Rother using Lillypond software was chosen. 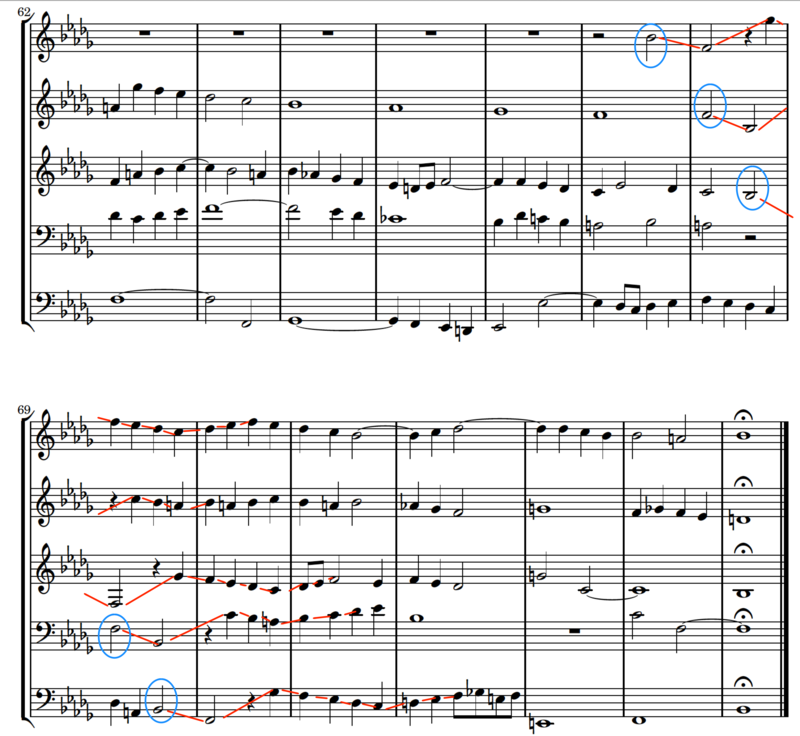 As a consequence, you can easily compare the default engraving styles of Musescore and Lillypond, side by side. The video is over one hour and forty-nine minutes long. Given that none of it repeats, and it is polyphonic throughout, that makes for some very dense listening (an attribute that you will grow to cherish as you build familiarity). But where to start, and how to listen if the music is totally new to you and you’re trying to get a toehold? Fortunately, a lot has been written about The Well-Tempered Clavier. A growing number of the pieces are discussed on the Open Well-Tempered Clavier website. There is a nice video from Dave Conservatoire, “What is a Fugue?” that features a performance of the C-Minor Fugue by Kimiko Ishizaka. Finally, there is an outstanding set of analysis with illustrations and examples by Timothy A. Smith — highly recommended! However, if you want to jump in and start listening here are some highlights to get you going. This one is a beloved favorite. Technically easy enough for many piano students to get through, its apparent simplicity hides the fact that the piece is a miracle of uniqueness. It defies all of the rules and norms of the day, and you can’t really find other pieces like it (unless they’re based on it). It’s a wonderful example of a fugue, with three voices, and you can start to get a feel for the whole idea of a fugue, where an initial melody, or theme, is presented by each voice, offset by time and pitch. This piece will teach you the meaning of sound colours on the piano. Listen to the repeated chords; each one sounds different from the previous, sometimes brighter, sometimes darker, always supporting the melancholic melodic lines. Joy. Pure joy. Much of music history was spent being sad, with upbeat music only serving to exacerbate the fall into emotional disarray (e.g. the entire Romantic period.) Bach, however, was capable of unfettered rejoicing, and this fugue rejoices quite merrily. This is a monster. With four voices, the technical challenges to the pianist are enormous. What’s more impressive, however, is how Bach takes you on a whirlwind journey that ends big. Really really big. The opposite of the Ab Major Fugue, i.e. no joy. None at all. Only sadness, yearning, and desolation. There are no words left for what Bach did with this. The fugue theme uses all 12 chromatic tones, and the resulting harmonies and structures as he develops that material are so inexplicable that music historians and analysts are left scratching their heads trying to explain how he created such wondrous and radical music. Pay careful attention to the three magisterial sequences that punctuate the structure of the piece. Here is the full video. Enjoy, and share with those who love music. J.S. Bach, Prelude No 1 in C Major, BWV 846 - video by Stephen Malinowski. J.S. Bach, Prelude in C minor, WTC I, BWV 847 - video by Stephen Malinowski. J.S. Bach, Prelude in C-sharp minor, WTC I, BWV 849 - video by Stephen Malinowski. J.S. Bach, Fugue in D-sharp minor, WTC I, BWV 853 - video by Stephen Malinowski.